Thursday gave us the latest in a series of announcements by Tesla Motors, giving updates on the Supercharger network for the Model S. The Supercharger network rollout so far has been slower than originally expected but is now accelerating, with the much-needed expansion beginning now. The Tesla Supercharger system is Tesla's implementation of DC Fast Charging for the company's all electric Model S. It offers a complete recharge in as little as 20-30 minutes, and thanks to on-site solar panels and grid storage the Supercharger system can operate even if the electrical grid goes down. According to Tesla CEO Elon Musk, it will even survive the Zombie Apocalypse. The Supercharger system has had a number of improvements since originally announced. One of which is to decrease the charging time. Previously a full recharge on a Supercharger was said to take about an hour, but that time has been decreased to 20-30 minutes. The improvement is currently in Beta test, will be rolled out this summer, and increases the charging rate from 90 kilowatts today to 120 kilowatts. Another improvement coming shortly is to increase the number of charge ports per supercharger station. Currently the stations support two ports, and this will be increased to four ports. The effect will be to increase the number of available parking stalls for cars being charged. 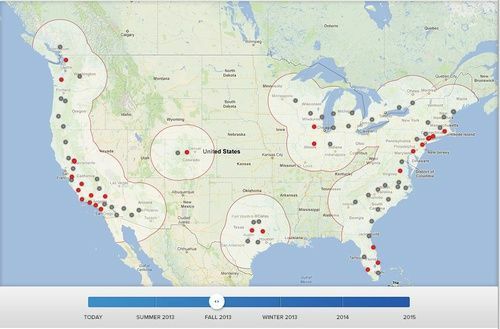 By the end of June 2013 the company expects to triple the number of installed Supercharger stations, with additional stations in California, the Northeast corridor, coverage of the northwest region from Vancouver to Seattle to Portland, Austin to Dallas in Texas, Illinois and Colorado. Within the next six months the system will connect most of the major metropolitan areas in the U.S. and Canada including expansion into Arizona, additional stations in Texas, Florida, and the Midwest, stations connecting Ottawa to Montreal, and across North and South Carolina into Georgia. It's claimed that one will also be able to travel diagonally across the U.S. from Los Angeles to New York using only the Supercharger network. Within a year they expect to have Supercharger coverage across North America, enabling travel coast-coast without spending money on fuel. The latter point is true because Tesla is covering the cost of the electricity. Owners of compatible Tesla Model S's, Model X's, and the future GenIII Tesla's will all be able to use the Supercharger stations to recharge their car for free. When fully built-out the Supercharger network in North America should be 200ish stations, with 25-30 in California. The company intends to cover popular travel corridors first and to install all stations at existing highway rest stops. A most interesting feature of the system is the intent to co-locate both solar panels and grid storage systems with the Supercharger stations. Most of the locations installed today have only the Supercharger station, but over time they expect to add first solar panels and later grid energy storage systems with about 1/2 megawatt-hour capacity. The purpose of the solar panels is to completely offset the electricity used to recharge the Model S's. The grid energy storage systems add in energy buffering, so that the electrical grid doesn't bear the full brunt of 120 kilowatts per car, and additionally will play some grid stabilization role. Elon Musk did not explicitly say this, but the grid energy storage units should also be a revenue stream for Tesla. Thursdays announcement covered only the Supercharger network expansion in North America. There is another network planned for Europe and other locales where Tesla will sell cars. Sales in Europe and Asia have not yet begun so it would be extremely premature to build Supercharger stations in those areas today. The announcement also did not cover any plans for battery pack swapping services. When asked about such a service, Musk carefully answered that battery swapping isn't a particularly brilliant idea, and that the question is whether it can be done at a larger scale, how convenient it would be, and the economics of offering such a service.